Happy New Year everyone!! Can you believe it's 2014 already??!! EEEEEEK! Time is flying by way too darn fast =( Just some quick swatches today of a gorgeous collaboration shade from piCture pOlish created with the lovely Rebecca from Rebecca Likes Nails. I am a huge fan of her blog - her swatches are so beautiful!! Inspiration: An electric guitar with shades of mint and silver within its make up! Siren Song is a stunning combination of mint green and silver particles melded together to form a metallic textured shade that just glides on your nail with a totally sparkling finish! Siren Song is a beautiful sea foam green with large silver shimmer through it. I'm always drawn to mint greens like this and I love the shimmer in Siren Song. The shimmer is quite large giving it a nice sparkle but it's not too in your face. Application was great and it dries to a textured finish so it's slightly gritty. If you don't like a gritty finish I'd suggest adding a layer or 2 of topcoat but I really enjoyed the finish so I left it as is! 2 coats is pictured. 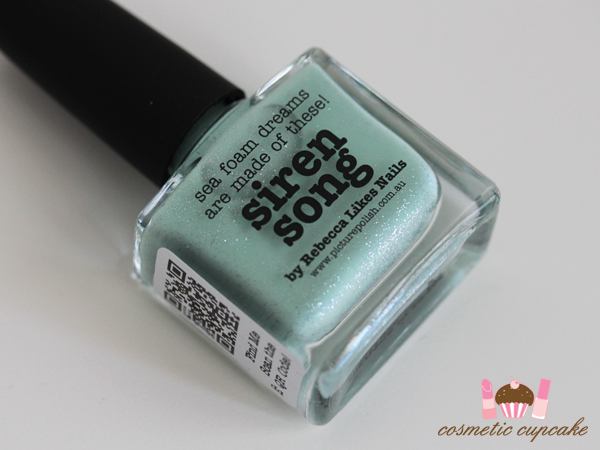 Details: piCture pOlish Siren Song is available from the piCture pOlish online store and Network members for $12. You can see Rebecca's post about Siren Song here! Glad you love it too!! Eek indeed! 2013 just flew by. Lovely color. I like that it's a bit shimmery too. that color is stunning!! Happy new year! !